Hotel le A describes itself as “so chic, so cool, so hip, so arty and so designer” and for those wondering where the name was devised, the hotel has a close connection to the letter A. 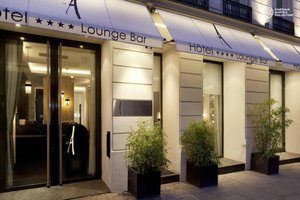 The A in “Rue d’Artois,” the 26 rooms representing the letters of the alphabet and the fact that the hotel was an Art gallery inspired the name of the hotel and after several months of renovations, the hotel was opened officially in 2003 as a modern, luxurious establishment. 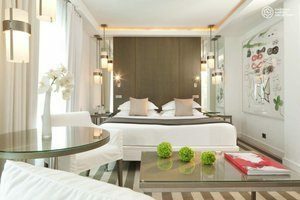 Hotel le A is enviably located between the famous Champs-Elysées and the Faubourg Saint Honoré, in the heart of Paris. In a small, quiet street away from the hustle and bustle of the city, the 19th Century frontage, adorned with bamboo conceals a convivial and relaxing Parisian mansion. The nearest metro station is Saint-Philippe-du-Roule (line 9) and for those with a car, the hotel boasts its own secure car park two minutes’ away on foot. Parking costs 25 Euros per day and can be paid directly to the hotel. Please let us know if you would like us to reserve you a space. As well as a 24 hour concierge, complimentary WIFI, a fantastic breakfast buffet, library, porter service and a media centre, Hotel le A boasts an elegant lounge bar. Beneath the 19th Century glass roof, the totally refurbished lounge bar resembles a trendy New York loft, with white bricks and signed artworks. 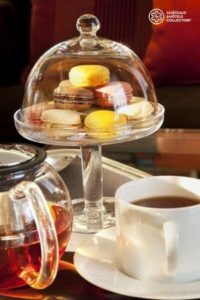 Teas and pastries are served in the afternoon and classic cocktails are always a hit with guests in the evenings. The hotel has 26 rooms across four room grades; Superior, Deluxe, Junior Suite and Suite. All of the rooms have been designed to provide a modern, dreamy setting with simple materials and a minimalist design. The wooden furniture and shades of grey and green against a white wall create a relaxed and easy atmosphere. Each room is equipped with a flat-screen television, a video and audio player, a light dimmer, a mini-bar, a private safe and en-suite facilities with bathrobes and a hairdryer. There is a turn-down service from 6pm to 8pm and room service is also offered.